I have a therapist website that I worry is not ‘search friendly’. I’ve had the site for 5 years and recently updated it with new info. What’s the criteria to make sites really found or displayed on the internet? Thanks for answering if you can. The question of how to get your website found on the internet is a good one. Getting found on the internet means those that are searching for your help are finding you, and that means increasing your likeliness of getting clients. As a whole, your question might be summarized as: what can be done to make my website found in search engines? The answer is a practice called search engine optimization or SEO. Let’s discuss. If your website has been online for 5 years, your website has likely already been found by Google. Try it out with me. Go to google, type in “site:yourwebsiteaddress” and see what comes up in the results. And what we’ll see at the top under the search box is the number of pages that Google knows about! Wow 241 pages! That’s what google has found for my website, empathysites.com. Try it out with even larger websites and you can see even more results. Think of the google index like a really really big phone book. The way to see what listings your website has in that book is by doing the “site:yourwebsiteaddress” search that we just did together. With over 3.5 billion searches per day, Google is the most-used search engine there is. And because google is driven to provide it’s searchers with the best and most relevant results, Google, on its own, without us doing anything, is searching the internet and adding our website to its own index. You do not have to do anything to make this happen! So the first thing to know is that your website is already “found” in that sense. It’s in the index, and possible to be matched to what searchers are searching for. Search Engine Optimization, often abbreviated as SEO, are all the tactics that people implement on their websites to increase the sites chances of coming up in search results. The complicated thing is that the “criteria” for being found isn’t so much a set of criteria as it is a set of educated guesses. SEO has no official guidebook and is always changing along with the search engines themselves. Perhaps a good way to think of what the criteria for being found is would be this: web pages that are the most valuable and relevant to searchers will be at the top of the search results. Now the way that Google and other search engines determine that is only really known through trial and error. And those tactics that have been discovered are what the practice of SEO is all about. There are so many ways to get found online. For solo and small group practices, ones in which you’ll be wearing the hat of doing all the marketing by yourself, you’ll want to discover which trail you’ll be happiest blazing to your site. Each type of digital marketing strategy will include different sorts of learning and action. And every therapist will need to discover what will be the best way forward for them. If you find what you love doing, you will be able to do it consistently. If instead, you are filled with dread when you are doing your marketing, you will never get it done. The most effective type of marketing is the marketing that is being done. Before you start spiraling towards some place where you think making your website ‘search friendly,’ is an absolute necessity, you should know that optimizing your website for search is only one of many, many different tactics to getting your website found online. Optimizing your website for search is one of the options. Not the only option. This means, you can explore what SEO, search engine optimization, is about and decide if it’s something you prefer to do over the other methods of marketing online. Part of the private practice journey is a journey of self discovery. Knowing what, out of these sorts of tactics, suits you best is the necessary self-awareness-check-in you’ll want to do before pushing your nose to the grindstone. How to leverage your website to get more referrals (the fastest way to grow your practice in the beginning). I outline how to put together a simple strategy including a sample strategy you could follow. Video interview with Kelly Higdon of Zynnyme on creating a simple online marketing strategy. 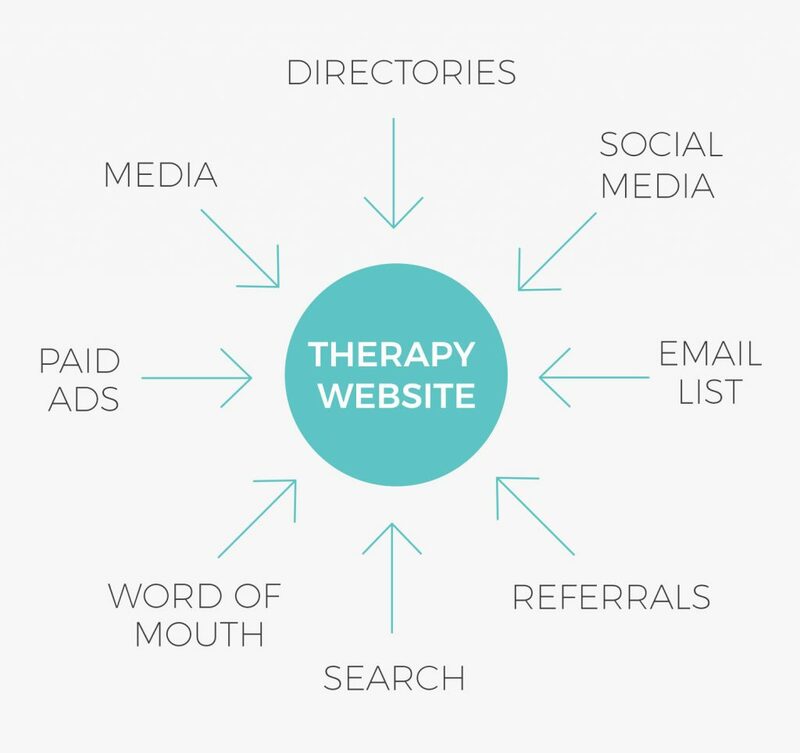 Also, check out my research on effective therapist websites, particularly how the most successful therapist websites get traffic. If you’ll be investing energy, time, and money into getting your website found, the preliminary step is to ensure your website accurately reflects who you are and how you help. The design should represent you and add to your credibility and the written copy should speak to who you are. Helps you stand out to referral sources who will recommend you and your website. Helps you showcase your expertise to increase your chances of getting in the media. Helps you attract links to your website, especially if you have high value content – people link to good websites that show good content. Keyword research find and research search terms that people enter into search engines while looking for therapy services generally and also specifically in your area. Rewriting your website so that each page is optimized with a unique keyword (and this includes rewriting and redoing some of the technical stuff like the page meta title, h1 title, image title and alt tags, and rewriting content to match a certain target keyword density). Getting listings and citations (simple how-to here) and updating your website to have your name, address, and phone number match those listings. Get backlinks, which are links from someone else’s website to your website. Search engines like google see backlinks as a vote of confidence in your website and may rank pages with many backlinks higher in search results. Create content like writing a blog, videos, or podcasts (transcribe video or audio content for best results). Creating content that addresses the needs of those who are searching improves your chances to rank – and also increases your credibility, helps you get shares, and backlinks. I Don’t Want To Do It Myself. Can’t I Just Hire Someone? Yes, you can! But it’s probably not be the best use of your marketing budget. SEO is awesome but it can also be slow. It takes time and consistent, strategic effort for a website to show up at the top (and beat out the competition for those top spots on a search engine result page). For that reason, SEO should be considered a long term strategy. It doesn’t make sense to invest money into SEO unless you have exhausted other marketing and sales strategies that are quicker, easier, and less expensive. In the first few years of practice in particular, spending on the long term strategies would mean less investment into your short term strategies. And you need to think about how to reach profitability and sustainability now so that your practice will still exist in the short term. Then, once you’re doing well, meaning you’ve already set up reliable systems for attracting clients with the short-term strategies, go ahead and explore how long-term marketing strategies might contribute to the vision you have for your practice’s future. If you are at the point where you’re ready to hire someone, expect to pay $600+ per month over at least 12-18 months for expert help. At the low investment point of $600/month, expect to see measurable results after 18 months or so, depending on how competitive your market is. SEO Is Cool, But So Is Being Kind To You! If you’ve read this entire post up to here, you’ll have noticed that I didn’t get out my SEO pom poms and try to just cheer you towards doing SEO. And to be honest, that makes me worried. It makes me worried that you, like many other therapists I’ve met, may be getting stressed, overwhelmed, and anxious about something you shouldn’t be! I don’t believe SEO it’s a good fit for every solo and small private practice. I’ve seen private practices absolutely thrive online and in their communities without ever “doing SEO. And with so many ways to get yourself out there, there’s no reason to pressure yourself into doing something if it’s not where your excitement lies. And in fact, allowing yourself the grace of doing what excites you will lead to better outcomes in your marketing. As long as you move forward with SEO with an awareness about what it is, what results you can expect, and with enthusiasm, I highly encourage you do so! Knowing how to do SEO yourself can help you immeasurably in the long term game plan. But the cost of your happiness is not worth it. Don’t worry, be happy, and do that by finding a marketing approach that works for you.